The American Livestock Breeds Conservancy was alerted to the precious genetic treasure. Under the direction of Dr. Phil Sponenberg, ALBC, the herd was trapped at the only water source, bloodtyped by Dr. Gus Cothran from the Kentucky Equine Laboratory, and distributed into various breeding groups. Due to a severe drought in 1990, the horses had to come to the last remaining water source. Mountain lions decimated the herd by killing most of the foals. By the time the round-up started very few foals remained. 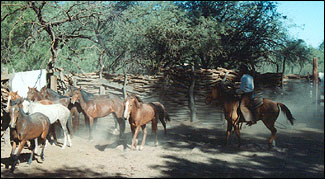 Arizona's extreme weather conditions had in some sense protected the herd. During the 100 years on the ranch the herd stayed relatively small (about 77 head), thus only the hardiest, fastest, most intelligent individuals survived. 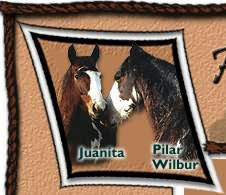 Dr. Cothran, director of the Equine Blood Typing Research Laboratory at the University of Kentucky, concluded that the Wilbur-Cruce horses were a "cohesive group based on type with nice genetic variability." The environment, isolation from other horses, and lack of human intervention had shaped this strain of Spanish Barb. It is important to realize that the rescue of this herd had been an ongoing project for more than 100 years. It was a struggle for the rancher to keep the herd intact. You can better understand this history by reading Eva's book and old newspaper clippings. Articles show how close the end of the Wilbur-Cruce horse came many times over the 100 years. Debtors wanting to take the herd for late lease payments, jealous neighbors plotting and starting to shoot the herd to destroy the woman owner and manager and to make more room for their own cattle, are just some of the examples. Eva's close connection and value for the "little rock horse" kept the herd together until 1990. Then the ALBC took on the task of continuing this line.